Luigi Pirandello was born into a middle-class family in Caos, Sicily in 1867 and died in 1936. Despite winning the Nobel prize for literature in 1934 and bringing revolutionary changes to the theatre, his work is these days little known in the English-speaking world and it seems almost unknown in New Zealand. His plays have apparently gained a reputation for being intellectual and difficult to act. 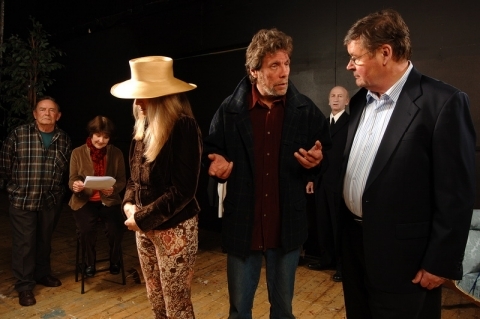 But the three that I have seen performed in the UK fascinated and intrigued me – and I have always been tempted by the idea of producing one for Eastbourne audiences who have shown themselves keen to have a varied diet of theatre. Translating was a challenging undertaking for someone who knows no Italian. I referred to five different English translations as well as the original Italian – and a dictionary. I have tried to be faithful to the author’s intent – while adapting the text to bring the actors and crew to present-day Eastbourne but maintaining the Characters in their 1920 Italian home. The rehearsal process has been fascinating as I found myself echoing and being echoed by the words and actions of Pirandello’s director – and reflecting on the many layers of aplay within a play that this wonderful work offers. The more we have explored it, the more we all feel that we are dealing with a masterpiece of European theatre. Six Characters in Search of an Author is an intriguing title for a 1920s play rarely staged by amateurs – because it’s deemed too difficult – but it was brought to astonishing life last weekend by Eastbourne’s Butterfly Creek Theatre Troupe. Italian Luigi Pirandello’s work explores the passions and adventures of six tantalising characters who confronted him in his imagination, and would not let go. And it challenges the audience to think about the big issues: truth, reality and illusion. John Marwick’s production pits a troupe of amateurs – playing themselves – against a family sextet who materialise in ghostly fashion from behind a veil while the troupe is preparing for rehearsal. The players’ director (Will Clannachan) is doggedly determined to match each funereally-garbed character with one of his own players in order to get his production under way. But the six Characters, especially the Father and Stepdaughter – played by real-life father and daughter Peter and Amber Baldock, who does a sensational vamp – challenge him all the way, resisting the idea that someone else should interpret their reality: surely they know their inner thoughts best? 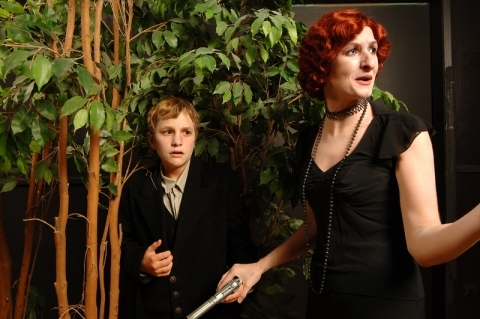 As each tableau Character reveals more of the collective tragedy – Fran Baldock as the Mother and Theo Nettleton as her Son, and the Boy and Girl, Connor Macrae-Clannachan and Isabel Stewart, statue-stiff until the dramatic denouement – the players’ attempts at acting out their counterparts’ torment become as risible as those more famous Shakespearian play-within-a-play scenes from Midsummer Nights Dream and Hamlet. Anne Manchester’s materialisation as brothel- keeper Madame Pace also provides comic relief. That the audience listened so intently to Peter Baldock’s sustained and passionate pleas is a measure both of his consummate acting and director John Marwick’s sensitive translation of Pirandello’s text. The whole Butterfly Creek team deserves – and got, on opening night – a huge hand for rising to this supreme challenge. It plays three more nights in Eastbourne before a short season at the Gryphon Theatre in Wellington. 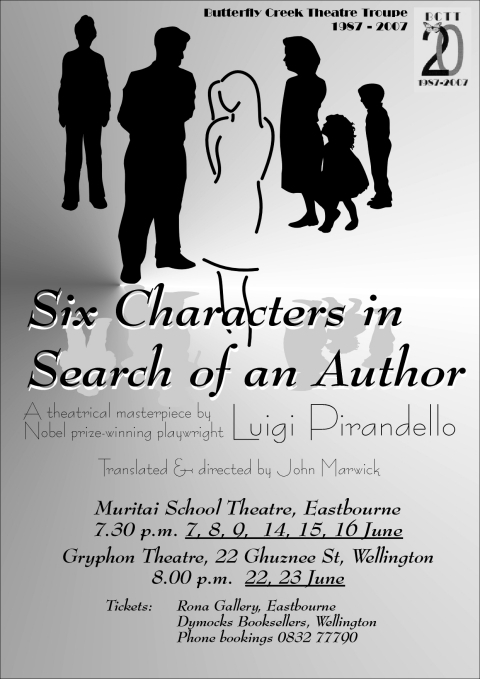 Six Characters in Search of an Author is Luigi Pirandello’s much touted classic, often name dropped but rarely seen. Butterfly Creek Theatre Troupe, a community theatre group based in Eastbourne, now offers an opportunity to view this searchingly existentialist piece about the nature of Pirandello’s “sprightly young helpmate”; Imagination. 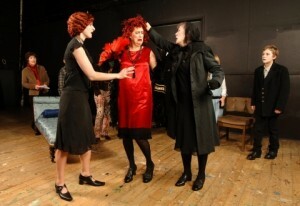 To confess: I am not much used to community theatre, and do not feel too well equipped to critique it. However, it was a warming experience to view actors and crew rehearsing Six Characters at Gryphon on a work night, the dedication and love for the art keeping their patience and spirits high and indeed keeping the BCTT alive for twenty years now. While the performances are, understandably, amateur and unpolished at times, two strong interpretations by Amber Baldock as Step-daughter and Peter Baldock as Father keep the production engaging, and humour from the ‘Director’ (Will Clannachan) and ‘Actors’ lightens the play’s graver moments. Director John Marwick has adapted Pirandello’s script to bring a modernised version that does not fall into the trap of over-kiwisation of language; the changes are just enough to convey the original meanings Pirandello intended. 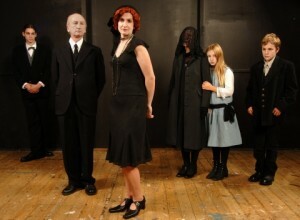 While further could be done to give the six ‘Characters’ a greater sense of unreality (I like the idea of the contorted, emotive masks Pirandello himself suggests) the disparity between Characters and Actors is vividly portrayed in the acting, excellent costuming, and use of theatrical space. With the exception of Amber and Peter Baldock the cast – especially the Actors – could work more to inhabit the set and match dialogue with physical acting and movement, however. While needing to pick up the pace somewhat, the first half conveys the essence of theatre as a game – a “play” – and successfully establishes the rivalry of Actors and Characters. The Actors are seeking to make their ‘play’ appear more real, ironically through the use of illusion; while the Characters seek to make clear the nature of their ‘reality’; as more immutable and solid than the Actors’. The second half continues to build on the tension of the first, and in several engrossing moments captures the drama of the central conflicts: the Stepdaughter-Father relationship, and the fates of the brooding, silent children. The Father delivers his lines forcefully and competently; his indignant touch of staunchness working well to maintain his pride and chauvinism. Perhaps Peter Baldock could work towards greater inflection and variation in this role however, as often the torment and horror of his character does not come through strongly enough. Similarly in his intimate battles with Stepdaughter, he appears too emotionally detached to give us a real sense of his remorse. Fran Baldock gives a smooth performance as Mother, her submission and sorrow believably all consuming. Theo Nettleton is also consistent as Son, though unclenched fists and greater use of gesture could help him to fit more comfortably into this role. And Joanna Hulme is a fittingly capricious Leading Lady; together with David Gledhill she provides enjoyable light relief to the Characters’ mournful story. In Six Characters in Search of an Author Butterfly Creek Theatre Troupe is providing a rare chance to view a challenging and multi-layered theatrical masterpiece. While obviously in a different realm from the likes of much professional theatre on show around Wellington, the show has moments of strong acting and healthy spirit. May I take off your little hat?